Trinity Theatre in my opinion has always been an underrated masterpiece, with its simple yet effective décor and its impressive proscenium arch that allows you to take a step back in time to the golden age of theatre. It’s been a while since I have visited, for which I am very much at fault, but it’s clear that a lot of time and effort has gone into the restoration of this beautiful building. Stage adaptations of well-known classics are always risky, as audiences are often unforgiving of adaptations that fail to meet expectations. 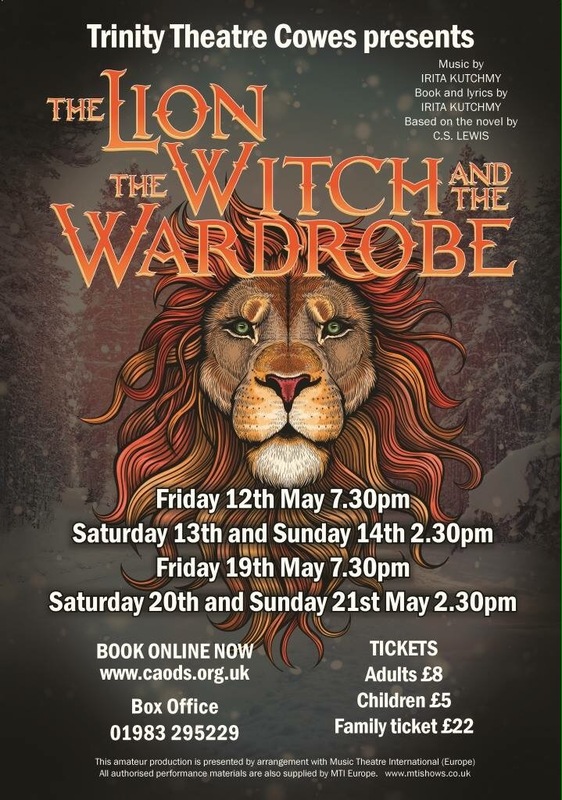 However, CAODS were in no danger of disappointing with a wonderfully sewn together production of The Lion, The Witch and The Wardrobe. The directors, Becky Giakoumelos and Dinah Bowman, clearly had a strong vision and the production was strung together with some impressive elements of stage craft, which gave the performance a deep sense of identity. The magical world of Narnia was created beautifully with a stunning backdrop, cascades of snow, and atmospheric lighting. Scene changes were seamless with next to no disruption to the production’s pace. The direction was creative and immersive; fittingly appropriate, for as Peter, Susan, Edmund and Lucy immersed themselves into the magical world—so did the audience. It must also be said that the costume department delivered some exceptional showstoppers. Ava Andrews (Lucy) and Lizzie Giakoumelos (Susan) not only delivered their lines with impressive projection and feeling but also showed natural theatrical aptitude. The Island would do well to watch these two young stars-in-the-making as I have no doubt they will continue to impress audiences. Equally important to the show’s success were the complimentary performances by Jack Jenner (Peter) and George Archer (Edmund); both boys delivered memorable performances with mature developed characters and strong vocals. It would unfair not to mention Savanaa Kellett, whose fleeting performance as the little Robin left the audience in stunned adoration. I truly felt Susan’s apprehension at meeting the legendry Aslan: How could such an iconic character live up to expectations? Andy Kay not only looked impressive but commanded the stage immediately. His stage time was short, but what his character lacked in stage time he certainly made up for with presence. With an unquestionable mighty vigour, Aslan was brought to life and all my fears were quelled. Grant Farley (Mr Beaver) brought humour, enthusiasm and charm to the production while Mike Santer enthused the young audience with his perfect portrayal of Father Christmas. Other notable performances included: Vicki Quilter who, with a strong vocal range and great delivery, portrayed The White Witch; Ed Nash, who scared audiences which his vicious deliverance of lines; and Joe Farley, who played everyone’s favourite fawn, Mr Tumnus, with strength. I truly enjoyed this production. Perhaps at times the vocals were a little quiet; however, the directors have been very clever in installing a choir to help lend a hand in times of trouble. The choir was not intrusive to the performance but complimented the sweet and endearing sounds of the forest animals. This production is perfect for the whole family and the entire team deserve to have their efforts witnessed. Catch the remaining performances on Fri 19th, Sat 20th and Sun 21st May. Book online now! Previous NEWS: Marathon Dancers seek FAME!